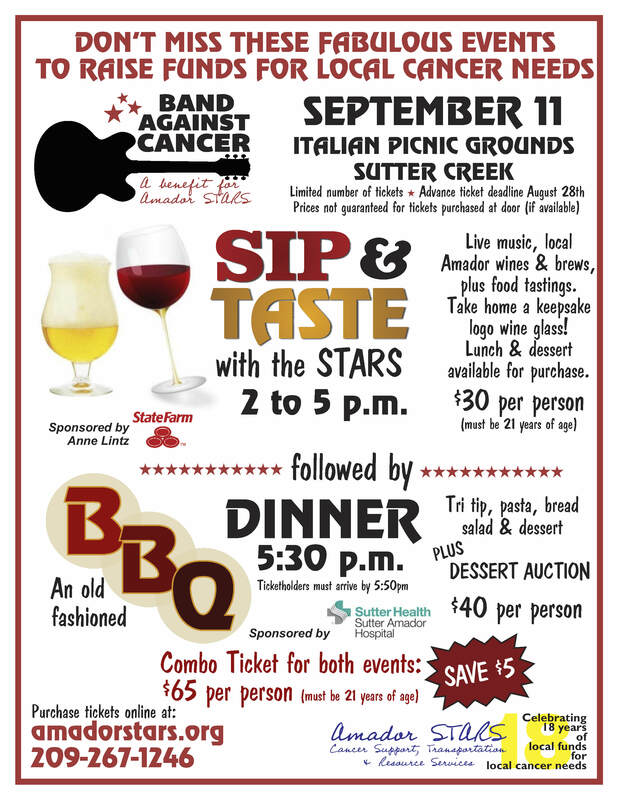 Our third annual Amador County Band Against Cancer will take place September 7, 2019 at the Italian Picnic Grounds. This free family-friendly community event features an all-day music festival, craft booths, quilt sales, fun zone, plus our Survivor Celebration. Our popular "Sip & Taste with the STARS" event returns this year, featuring local wines & brews. In the evening, enjoy our BBQ Dinner and Luminary Ceremony. More details below. Bring your family and friends! Our goal is to fill the Italian Picnic Grounds with community members sharing fellowship and raising funds for Amador STARS! This is a community event and it certainly does take a village to make it happen. We would like to extend a huge thank you to all our volunteers, sponsors, musicians, teams and attendees of our 2018 event. With your help, we raised nearly $130,000! Contact the STARS office at (209) 267-1246 or use the tabs below for more information on getting involved! Sip & Taste with the STARS featuring local wines & brews Pre-order tickets now! Have a blast at our old-fashioned BBQ Dinner Pre-order tickets now! 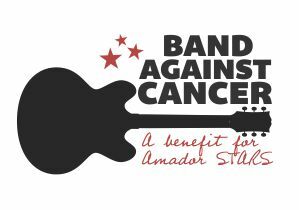 For more information on corporate sponsorships for Band Against Cancer, please call the Amador STARS office at (209) 267-1246. We would like extend a huge thank you our corporate sponsors, and to the other local folks who donated time, product and services for the event. Please support these local businesses! 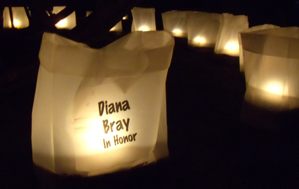 In the evening at Band Against Cancer, we will have thousands of illumination candles lining the event. Each candle honors someone who has been touched by cancer or has lost their battle with cancer. Each bag bears a name and optional sentiment, and each name will be read aloud September 8 at 7:00pm at the Italian Picnic Grounds. You can support local cancer needs and show your appreciation to a special person by purchasing a luminary candle for a suggested donation of $5. For more information on the luminary ceremony, please call the Amador STARS office at (209) 267-1246. Survivors will enjoy a complimentary brunch at 10am with live mellow music by Herb Boxhorn.Enjoy fellowship, fun, and free gifts in a comfortable shaded location. Survivors are welcome to bring friends and family to this special event in your honor. You may purchase additional brunches for your guest(s) when you register. We ask that you check in between 9am and 10am and be seated for brunch promptly at 10am. Afterwards we invite you to stay for the Band Against Cancer activities -- quilt sale, raffles, live entertainment & much more! If you would like more information, please call the Amador STARS office at (209) 267-1246. 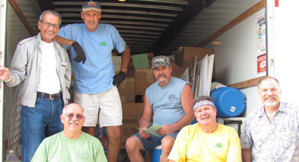 As a team member for Band Against Cancer, you join a group of family, friends, coworkers, neighbors, etc. There is no specific number of people needed for a team. 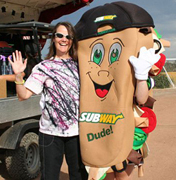 You and your teammates can be as creative as you like with a team theme, costumes, decorations, and even a mascot! You can work toward a team goal and participate in team fundraisers (car wash, bake sale, bingo, etc.). Illumination candle orders can also count in your team fundraising. As a team captain or co-captain, you organize a group to become a team, attend a captain's meetings to obtain updated information on the event, and communicate that information to your team members. Our first captain meeting is June 20 at 5:30pm at Hotel Sutter in Sutter Creek. Appetizers, tea and lemonade will be served ($5 cash donation requested). Cash bar available. Remember that all funds raised will remain in Amador County, except for 8% that will be dedicated to cancer research. You can help in this venture by getting involved in the event. 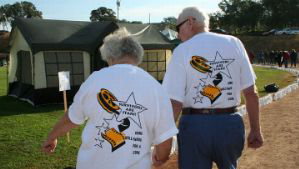 STARS is proud to help meet local cancer needs and assist in the search for a cure. Watch this page for registration and details. If you have not previously been involved and would like more info, please call the Amador STARS office at (209) 267-1246. As a committee member, you will help with the organization of the event. Here are some ways you can get involved: Illumination Ceremony, Food Service, Survivor Celebration, Entertainment, Nutrition and Education, Decorations, Fun Zone, Youth Coordination, Pink Ribbon Store, Logistics, Setup/Tear Down, Parking & Security, Tidy Time/Recycling. Our first meeting is June 20 at 5:30pm at Hotel Sutter on Main Street in Sutter Creek. Appetizers, tea and lemonade will be served ($5 cash donation requested). Cash bar available. We are always looking for new committee members, so if you would like to get involved or have new ideas for the event, please contact Lead Chairperson Donna Jackson at 585-6092 or donnajandarronj@att.net.